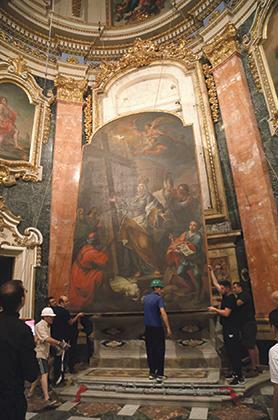 The titular painting of St Helen’s Basilica in Birkirkara, featuring the saint’s discovery of the Cross in the Holy Land, is getting a much-needed facelift and the public can view the works in progress during an open day on Saturday. The titular painting of St Helen being taken down last October. 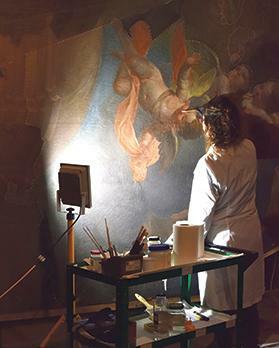 The Collegiate Chapter of the Basilica has entrusted the conservation of Francesco Zahra’s 1763 masterpiece to Atelier del Restauro Ltd, which had previously carried out the conservation of the basilica’s titular polychrome statue of St Helen. Zahra’s largest canvas painting, measuring 370cm x 550cm, is of historical, artistic and religious importance. 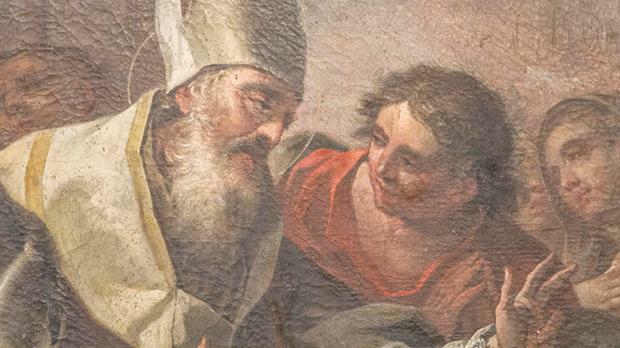 “The painting was completed at a time when Zahra was regarded as being the most significant painter in Malta,” said Mgr Paul Carmel Vella, the Provost Archpriest of the basilica. Mgr Vella explained that Zahra was inspired by the famous marble statue of St Helen by Italian sculptor Andrea Bolgi, found at St Peter’s Basilica in Rome. Both depictions of the saint demonstrate similar poses, physical structure and draping of her robes, he notes. Furthermore, it is thought that Salvatore Psaila was motivated by Zahra’s painting to sculpt the titular statue of St Helen in 1837. The scene depicted in the painting tells the story of St Helen, the mother of Emperor Constantine, as she goes on a pilgrimage to the Holy Land. 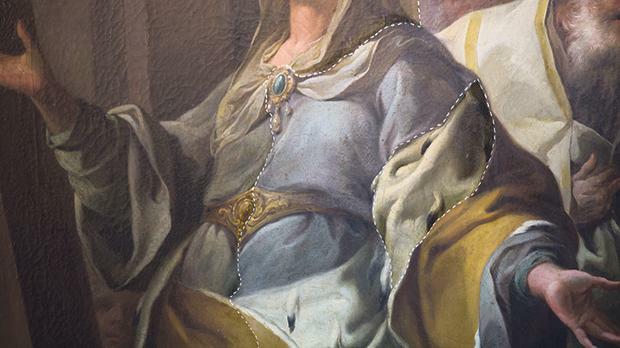 Conservation works included the removal of the oxidised varnish layer, overpaintings and embedded superficial dust. While on her travels, she discovers the ‘True Cross’, which is the name for physical remnants which, by the Christian Church tradition, are said to be from the cross upon which Jesus was crucified. Visible in the painting as one of herfollowers is Bishop Macarius, or St Macarius of Jerusalem, who is seen in front of a large building which likely refers to the Church of the Holy Sepulchre. “This building was constructed on the site of a pagan temple, on the request of the saint. The remains can be seen at the feet of the saint, shown as debris and a broken statue,” Mgr Vella pointed out. Conservation work started in October in one of the lateral chapels of the basilica. After thorough photographic and graphic documentation and cleaning tests, a meticulous cleaning process started. 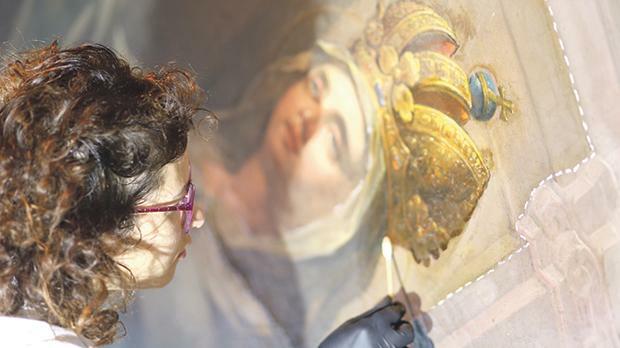 “This included the removal of the oxidised varnish layer, overpaintings and accumulations of candle sooth, including wax droppings,” said Valentina Lupo, who is leading the project together with Maria Grazia Zenzani. A detail of the painting which shows Bishop Macarius, who accompanied St Helen in her search for the True Cross in Jerusalem. To date, half the painting has been cleaned. 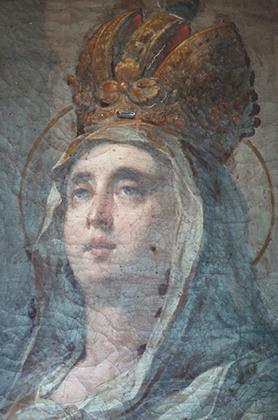 A detail of the painting showing St Helen before the conservation works commenced. “The bright colours and evocative light of the pictorial layer is visible once again,” Ms Lupo added. The project also includes the conservation of the original strainer frame which will be modified according to modern conservation practices in order to support the painting. The fine gilded decorative sculpture around the recess of the painting will also be conserved. Works are to be completed in time for St Helen’s feast, which this year will be celebrated on August 18. Mgr Vella, however, revealed that other embellishment works are in the pipeline. “I plan to continue, given the generous offerings of the congregation, with other projects to bring the splendid basilica to its original glory,” he said. The open day is being held at St Helen’s Basilica on Saturday between 9am and noon and 3.30 and 5pm. This photo, taken during the cleaning of the tunic, shows a dark, oxidised varnish layer over the original colour on the left, while on the right is the original vivid blue colour that emerged after the cleaning process.